Dora and Boots are in Wizzle World, trapped inside the Magic Storybook! Dora has the wishing crystal and needs to bring it to the Wishing Wizzle to get home. The mean witch, la bruja, is chasing after Dora and Boots, trying to steal the wishing crystal. Help our friends escape the witch as they cross Sea Snake Lake, through the Dancing Forest, across the rainbow and to the Wishing Wizzle. 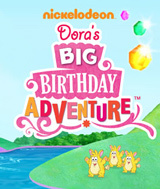 Then help send Dora and Boots back to the Rain Forest in time for Dora's birthday party. Comments: This is a great game where you and Boots are trying to defeat the evil with Bruja. To make it back home in time for Dora's Birthday party. You do tis by solving puzzles, helping out locate correct colors, numbers and more. How can you go wrong with learning ang having great fun rolled into one.